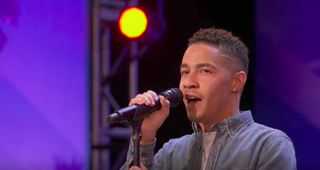 It was an emotional night on America’s Got Talent as the show paid tribute to Dr. Brandon Rogers, a contestant who was killed in a car accident shortly after his audition. “At the request of his family we would like to honor his memory by sharing his audition with you,” producers said in a statement that aired before Rogers’ appearance. Before his performance, Rogers spoke in the video about what inspired him to become a doctor. “My inspiration for becoming a doctor was kind of born out of a pretty tough experience when I was about 6 years old when I came home from school one day and found my mom laying in a pool of blood,” Rogers explained. The 29-year-old Virginia native performed a version of Stevie Wonder’s hit “Ribbon in the Sky.” After Rogers received a standing ovation, Simon Cowell said that Rogers was one of the year’s best singers.